An umpire's positioning on the bases—especially taking a runner into second for the out/safe swipe tag call on a stolen base attempt—often times helps dictate success in this realm of play calling. In the past, we've spoken extensively about the "keyhole angle" and its importance to play calling success in swipe tag and steal play situations. "You can't fault the umpire...positioning"
In this analysis, we highlight such positioning by 2B Umpire Mike Muchlinski, who has thus far experienced two replayed stolen base (or pickoff) attempts at second base over the season's opening week, both of which have been overturned via Replay Review. The fact that both calls were overturned isn't necessarily significant nor startling: calls were affirmed (confirmed and "stands") 48.3% of the time in 2016 (that's 709 upheld of 1468 reviews, for a .483 Review Affirmation Percentage [RAP], the first season with a majority of reviews resulting in an overturned call). As is said in the world of statistics, everything averages out eventually: 0/2 hardly is bad news and more likely than not means that the next few calls will go the umpire's way. That said, there is more to Muchlinski's two overturned SB calls than simply stats, and it relates, at least in part, to a deviation-from-the-norm Muchlinski has incorporated into his second base umpiring positioning. Circling back to the keyhole angle, recall the concept of "action area" as discussed on the "Steal Plays at 3rd Base" Tmac's Teachable Moment. Essentially, an umpire reading the play before it happens will project where the imminent action will occur—what side of the base it will occur on—and position adjust accordingly. Diagram of (simple) runners-on positioning. For most steals of second base, that action area corresponds to where the throw and runner come from: the inner infield, or the baseline between first and second. Rarely, on stolen base and pickoff plays, will the action area be outside of the infield (e.g., as if being thrown from the outfield). 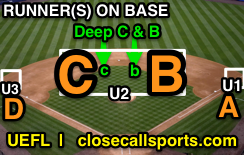 Umpires may be familiar with "B" and "C" positioning—essentially describing how an umpire lines up on the right field/first base side of second base (Position B) or the left field/third base side of second base (Position C), and what is known as "Deep B" and "Deep C," which are generally the preferred spots from which to take a runner sliding into second base and the swipe tag attempt on a stolen base, so as to maximize exposure to the projected action area. 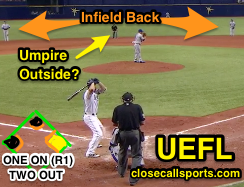 Without getting too bogged down with positioning minutiae as relates to different runner(s)-on-base scenarios (e.g., with the bases loaded, the second base umpire generally sets up inside the middle infield, but will be outside if the infielders are playing in, etc. ), standard positioning for a runner-on-first-only situation holds that the second base umpire is inside at one of the B or C iterations, whichever is most comfortable (again, comfort and repetition are key to getting the play right). Umpire MM's positioning with one on, R1. From this position, the second base umpire will have all stolen base attempts into second—from inside—and will not go out on any fly balls (as opposed to, say, no runners on base and the second base umpire starting outside the infield in shallow left or right-center field, when this umpire will go out on any fly balls to center field). The rationale is that inside B or C will place the second umpire in optimal position for seeing swipe tags on stolen base attempts. As the corresponding photograph indicates, however, 2B Umpire Muchlinski is positioned outside of the middle infield even though both situations were: infield back, runner on first only. This is not a question, per se, of "is the position right or wrong?" 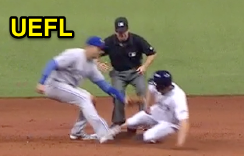 Even though Muchlinski took two stolen base plays from this position, resulting in two overturned calls, it is not necessarily the fact of outside vs. inside that contributed to the resulting .000 RAP. Where is the keyhole angle on this SB play? By illustration, let's assume you were right handed your entire life, and only recently discovered some benefit to be derived from writing with your left hand. It would probably take some time getting used to the new technique. That's likely what we have here: an adjustment period. Anyone—and that includes umpires—will get better with greater comfort and repetition. After all, as this photograph from Cleveland-Texas indicates, Muchlinski's instinct is still to find the keyhole angle, albeit from the obverse position. Although the MLB Umpire Manual doesn't advocate the runner-on-first-only, outside-umpire position (hint: inside is king), trying out a new approach—especially early in the season—isn't the end-all-be-all. April is still early enough to adjust to whatever works best.